Are you a frequent flyer? 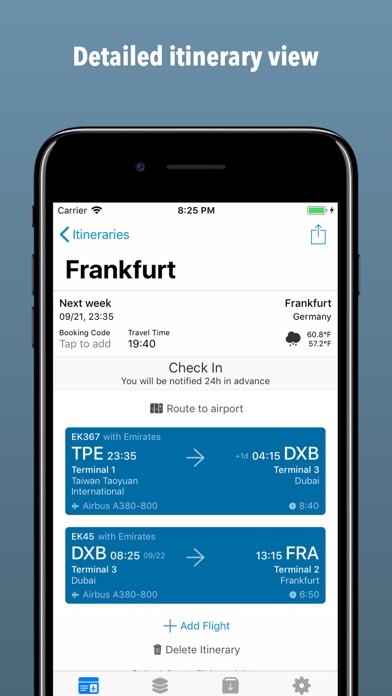 Tired of searching for itineraries in your emails and having the check-in app of every airline installed? With Boarding Pass all your flight information is just one tap away and you have quick access to direct check-in with over 100 airlines. Keep track of your itineraries. Find out how to get to the airport and which terminal your leaving. Check the weather at your destination. And never forget to check-in for your flight in time because we'll send you a notification. 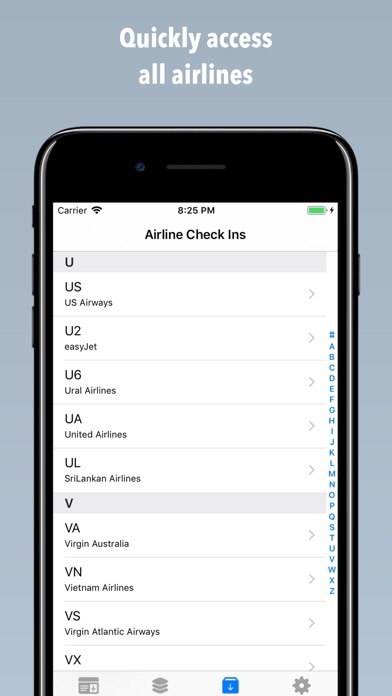 Replace all your mobile check-in bookmarks and apps with one universal app. ______◢◤ FEATURES ◥◣______ ▪ Quick access to check-in websites Check-in for a specific itinerary or choose direct check-in from a list of over 100 airlines. ▪ Check-In reminders 24h before departure Turn on notifications for itineraries and never forget to check-in online. ▪ Share your itinerary Let your clients, family and friends know when arrive at the airport. ▪ Weather information Pack the right clothes by checking the weather for your destination. 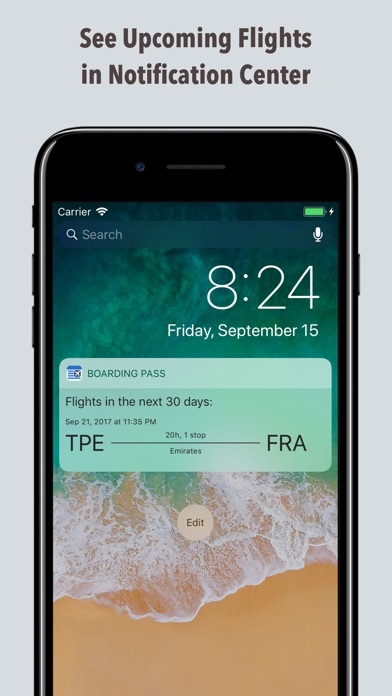 ▪ Notification Center widget & Apple Watch app Add the Boarding Pass widget to your notification center or Apple Watch to always have an overview of your upcoming flights. ▪ Airport Information Know how to get to the airport and which terminal your flight is. ▪ Easy to use, intuitive interface Quickly add itineraries with just a couple of taps using our smart input form which knows about almost all popular flights. ▪ iCloud sync between all your iOS devices Create an itinerary on one device and check-in on another. ______◢◤ Notes ◥◣______ ▪ Boarding passes The check-in feature gives you direct access to the airline's mobile/web check-in page. Many airlines will also display the boarding pass and/or a barcode after checking in (in addition to sending it to you via email). In that case you can save it directly from within the app for later access. This works by saving the contents of that specific part of the website. Please note that this is not support by all airlines. 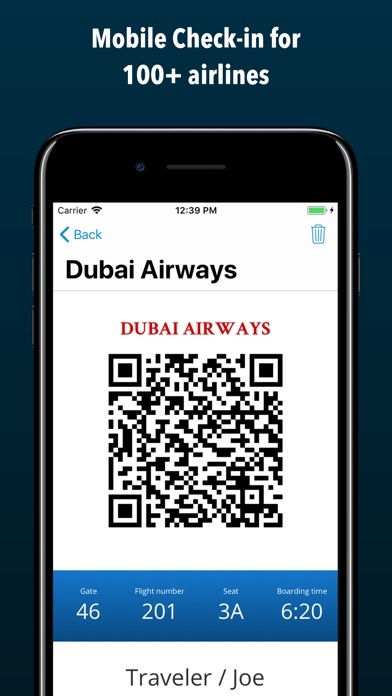 ▪ Direct check-in The check-in feature gives you direct access to the airline's mobile/web check-in page. We currently support these airlines: Adria Airways, Aegean Airlines, Aer Lingus, Aeroflot, Aeromexico, Air Asia, Air Berlin, Air Canada, Air China, Air France, Air Malta, Air Namibia, Air New Zealand, Air One, Air Transat, AirBaltic, Airtran, Alaska Airlines, Alitalia, Allegiant Air, American Airlines, Austrian Airlines, Avianca, Bankok Airways, British Airways, Brussels Airlines, Cathay Pacific, Cebu Pacific Air, China Airlines, China Eastern, China Southern, Condor, Continental Airlines, Croatia Airlines, Cyprus Airlines, Dragonair, EasyJet, Edelweiss Air, EgyptAir, El Al, Emirates, Ethiad Airways, Ethiopian Airlines, EVA Air, Finnair, Flybe, Frontier Airlines, Frontier Airlines, Garuda Indonesia, Germanwings, Hawaiian Airlines, Hong Kong Airlines, Iberia, Icelandair, Japan Airlines , Jet Airways, Jet2, Jetairfly, JetBlue Airways, Jetstar, Kenya Airways, KLM, Korean Air, LAN, LOT, Lufthansa, Luxair, Malaysia Airlines, Middle East Airlines, Niki, Norwegian Air, Oman Air, Qantas Airways, Qatar Airways, Qatar Airways, REX, Ryanair, S7 Airlines, SAS Scandinavian Airlines, Saudi Arabian Airlines, Shanghai Airlines, Silk Air, Singapore Airlines, Skywest, South African Airways, Spirit Airlines, SriLankan Airlines, Sun Express Domestic, Swiss, TAM, Tap Portugal, Thai Airways International, Thomas Cook Airlines, Tiger Airways, Transavia, Tuifly, Turkish Airlines, United Airlines, Ural Airlines, US Airways, Virgin America, Virgin Atlantic Airways, Virgin Australia, Vueling, Westjet, Wizz Air. Please note that we are not affiliated, associated, authorized, endorsed by, or in any way officially connected with any of the airlines. After you get used to it, nothing is more convenient than directly getting your boarding pass thru this method! Easy to use and provides just the right amount of information! Didn't help anything and said it was free when I first downloaded it then charged me 5$ and it says it's ineligible for refunds so I'm am extremely unsatisfied.